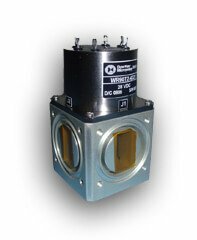 Thisÿnext generation of military and commercial Lightweight Waveguide switches are superior to previous designs in terms of weight, size, and current consumption. The total weight for the WR-62 has been reduced by 46% and by 55% for both WR-75 and WR-90 waveguide models respectively to a weight of 300 gram (10.6 oz.). Also, the overall dimensions are slightly smaller when compared to earlier designs and the new waveguides draw 65% less current which is equivalent to 350 mA.It is availabe in sizes from WR-28 to WR-112.